Stand Alone Door: Is this door really Self Supporting? One of the many questions that people ask us here at Higher Power Doors... "Is this door really self supporting?". The answer is always YES and we direct them to this video on our website. We've had comments saying that the video has been edited to make it appear self supporting. This video has NOT been edited to make it appear to be standing alone. This particular Higher Power Door is now part of an airplane hangar located at the Southwest Reginal Airport (KBEH) in Benton Harbor Michingan. We are the only manufacturer of the Stand Alone Door. This hangar door is so simple and requires nothing more than a common framed opening - saving you hundreds if not thousands of dollars. Plus, we have made hangar door construction more affordable than ever. This self-supported hydraulic door doesn't rely on the building for structural support. 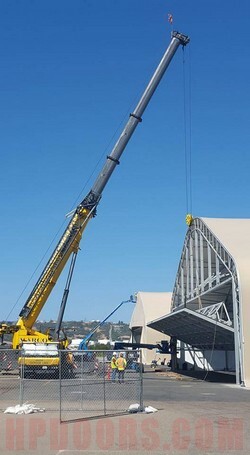 It's a fact that Higher Power Door customers can build an aircraft hangar for less. Call one of our consultants today for a quote on the simplest and most design efficient hangar door system available. Free standing door with no building support. No massive header or horizontal bracing required. Door imposes no load onto the building. Only wind load is transferred to your building. Suitable for new, or existing structures. For new or existing construction. Requires only 6-1/2 inches of headspace. Sizes available up to 160ft wide and 65ft tall. Installation-friendly to all types of structures. Vertical cylinders maximize safety and efficiency. Approximately 1/3 of the door pushes back inside the building. No hinges, straps, cables, pulleys, slats, or rollers! Some day this door will help support a building!